The kids and I went to peck farm this morning to have a little adventure before lunch. We were able to climb to the top to the observation silo and view the whole park. We looked at the animals and artifacts on display in the farm house and walked through the garden. But the best part was going in the butterfly house. 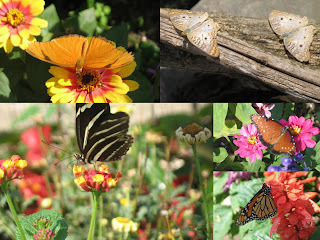 There were lots of butterflies to see and it's easy to get real close to them. We weren't lucky enough to have one land on us but Jake had lots of fun taking pictures of the many butterflies. That looks like fun!!! I love butterflies!! Wish we had something like that around here. How fun! Maycie would have loved to tag along and see all of the butterflies.